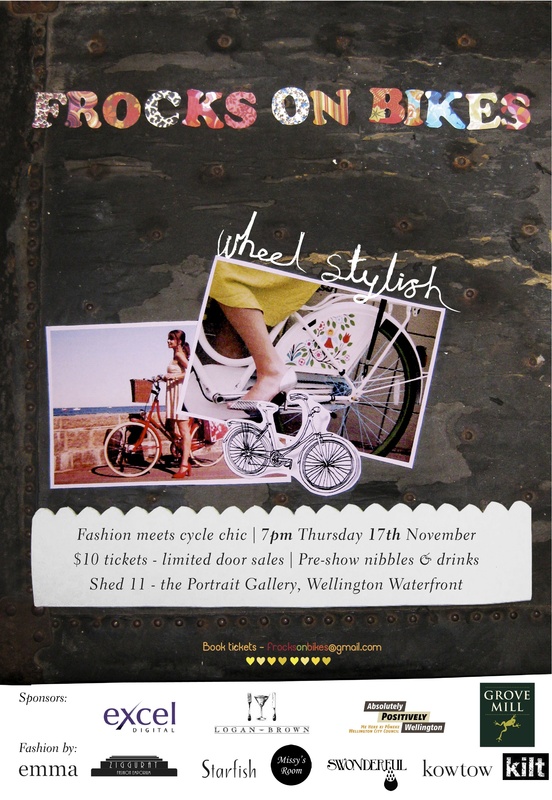 Wheel Stylish is the pinnacle event of Wellington’s Frocktober. a full fashion show where the runway is a cycle path. Gorgeous Wellington women (no professional models!) 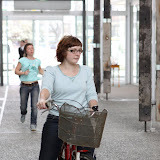 showcase fabulous local fashion on beautiful bikes. It’s a glamorous and fantastic event – not to be missed! Scroll down for coverage of Wheel Stylish 2011 – and see below that the first-ever Wheel Stylish in 2010! fashion goes up a gear! 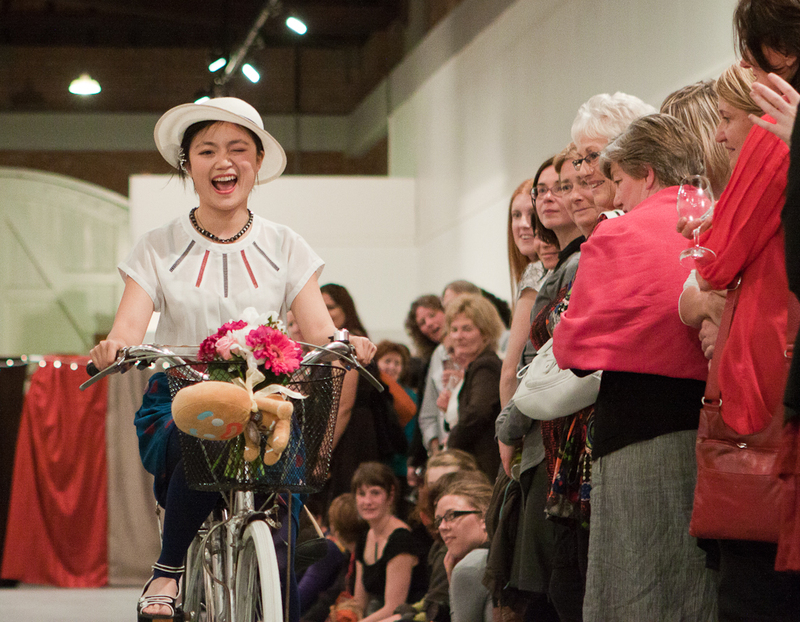 The worlds of fashion and bicycles came together on Thursday 17th November in Wheel Stylish, a fashion show celebrating the winning combination of stylish clothing, women and bicycles. Wellington’s iconic Shed 11 hosted the glamorous event, and doors opened at 7pm to a sold-out crowd. They enjoyed delicious sustainable nibbles and drinks by Logan Brown, Momo, Grove Mill and Teza before the fashion show kicked off. Kilt, Ziggurat and Emma. 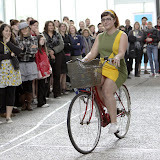 Their designs were modelled by gorgeous Wellington women who took to the runway on beautiful bikes by Mamachari, Giant, Phillips, Raleigh, Specialized, and Pashley. Wheel Stylish moved to the Northern Soul music of The Souled Out Collective, and the crowd was wowed by breathtaking breakdance from the Top Secret Crew in the intermission. Threading all this together were the dulcet tones of the Wheel Stylish MC, the glamorous Holly Ewens (a.k.a Betty Grey of Rosy Tin Teacaddy). 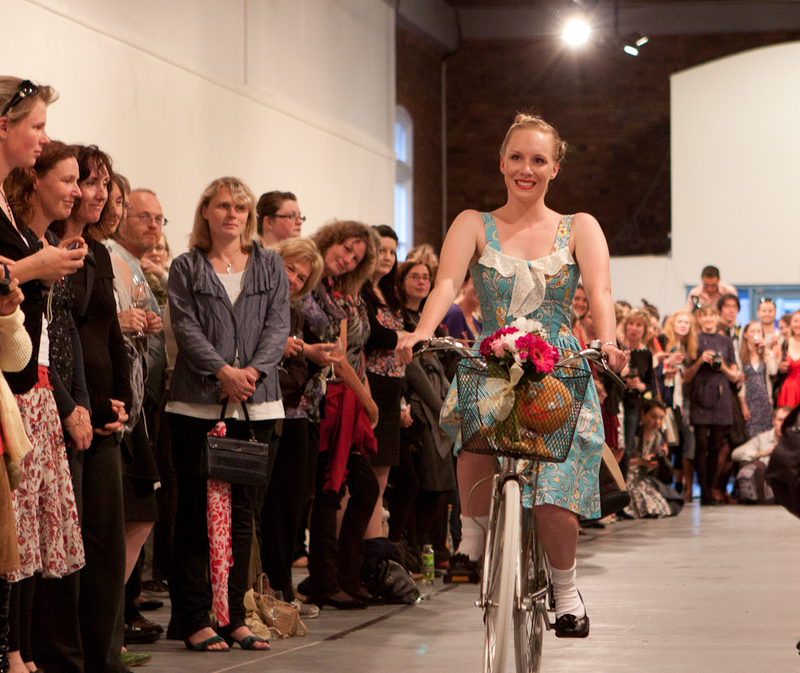 Wellington Frocks On Bikes crew Leah Murphy, Christina Bellis and Isabella Cawthorn – with event manager Claire Pascoe – are “absolutely frockin’ delighted” with the sold-out event. The crew send heartfelt thanks to all those who made Wheel Stylish 2011 possible. We have still photos and video below! Wheel Stylish 2010: a visual feast! The fashion was the heart of the show: the finest of Wellington’s thriving fashion industry. De Nada, Starfish, Voon, KowTow, Emma Collections, and iconic vintage boutique Hunters & Collectors. They love what Frocks On Bikes is about: that “cycle wear” is anything in your wardrobe – or that you want in your wardrobe! Mamachari Cycles and R&R Sportprovided beautiful bikes – unique restored Japanese secondhand machines and the brand-new equivalent with all mod cons – the TrailGlide. You helped us make Wellington Wheel Stylish!